Any Rogers Lumia 920 users got 1308 update? Anybody else having issues with wpcentral live tile not updating? Personally I'm noticing some issues with live tiles and push notifications outside of the data issues. I definitely wasn't experiencing these before the update. But something definitely broke these tiles/apps. Not saying all tiles have been affected but some that were working fine before no longer show tile notifications and some push notifications have stopped appearing. Not everyone is on the Rogers network. Yeah I'm having minor LTE drops here and there. =( I hope we can get the 1314 fix update or something. I know not everyone is on the same network. What I meant was that it seems like everybody on Rogers has the data problem....everybody outside of Rogers are in the clear. I can understand if you have other issues that need to be addressed (e.g., black screen during call), but if everything is OK, I'd hold off until we have a better idea. Clearly users are experiencing issues. We would definitely need a new patch to fix whatever is going on. I believe someone earlier said Nokia is made aware of the issue. That's comforting to hear. Thank you. Ok so here's something odd. Just got an update for the "network+" setting. After installing it I opened it to see if anything had changed. Call waiting and call forwarding are now greyed out (before they weren't). It says on the top of the screen that call settings don't work on 4G and to switch to them on I need to change to the highest connection possible in the cellular settings. I've gone into "celluar" and LTE is set as my highest connection speed. Wtf. Anyone else notice this. Not sure if it's related to our data issues from 1308. Btw, I'm on Rogers and I'm downtown Toronto. I HAD tiny image glitches when scrolling on Gleek, but now the OS feels robust and the battery consumption has improved in a great way since the update. User experience has improved and now feels a lot lore stable and fluid. I have yet not experienced what other respondents did. I really do appreciate my first Nokia/WP8 experience thus far. WPcentral panel are pros with their quality workmanship given which makes for great forum discussions. I'm on Rogers and I haven't noticed any LTE drops in my day to day activities. I'm on 100% LTE, never wifi. Is there a scenario I can test against that will cause a drop? 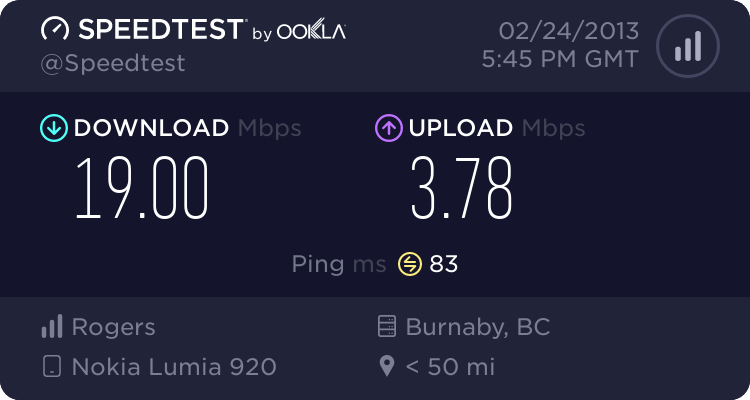 You may not notice a drop but those speed tests show pretty clearly that your lte connection is messed up too. Rogers Lumia 920 on Rogers network. We haven't noticed any issues since the update, just improvements. Likin' the new storage check. I know that doesn't help you folks with issues, however, just wanted to let you know that it's not all rogers customers. Well I suppose it's possible not everyone on Rogers is experiencing issues. Though I'd imagine some just can't tell the difference too. I recall ATT users did a poll and while not everyone experienced issues it was clear there was a problem for many. Personally, this data issue has become a very large aggravation since last week. I've had to re-send many SMS that failed, I've missed calls due to no signal and have had vmails just show up with no missed calls. I watch my signal more than ever now and I see it drop to no signal quite often. Also noticed another annoying bug. I've only witnessed it 3 times but for a split second my phone has made a funny, glitchy noise with the phone on completely silent. Which technically shouldn't happen at all on silent. It's like it was about to make a system sound and then it caught itself less than a second in and stopped itself. Weird I know. Anyone have more news of the fix coming and how soon?? I did the 1308 update the day it came out and noticed my L920 was faster plus I freed up 3.5GB. My signal pre-1308 would pretty good. When I updated my signal was the same as far as I remember. Then I did the network+ update and the following day I was out shopping and I noticed my signal had dropped off but I was in a building and so I just figured there was no signal in there. Once I got out my signal never returned. I did a soft restart and the signal came back. Since then my signal drops off at random and for durations of time that I seem to have no control over. I do a soft restart and the signal doesn't always come back. I cant verify my signal speed has degraded because I didn't test pre-1308 but I would seem that it may have suffered as well. I live in Surrey, BC a suburb of Vancouver so the signal should be good all the time. I recalled doing a few speed tests late last year and got as high as 19mb/sec on a few rare occassions. But I was usually in the lower to mid teens for the most part. I'm downtown Toronto btw. Supposedly the 1314 update is now rolling out globally. Lets see if Rogers 920 also gets it. 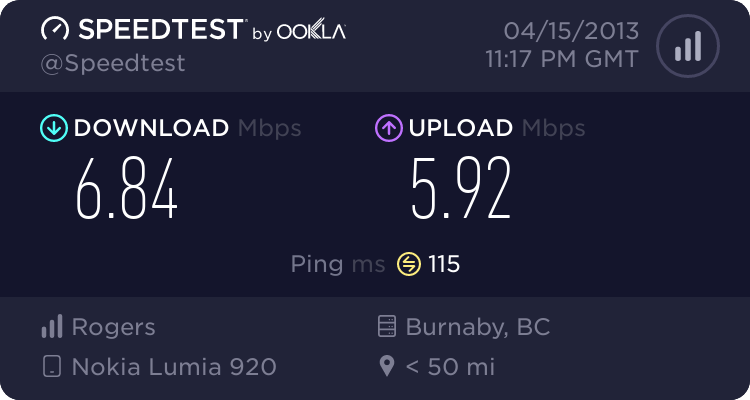 Since the update my speed is all over the place, testing in the same spot, 5mb/sec, then 14, then back down to 5, also downtown Toronto. Also, I miss the rattle vibrate, so weird, but I actually got used to the sound, so now when my 920 vibrates it sounds weird to me. Let's hope that update 1314 update comes to Rogers. Fingers crossed. I can't personally say I miss the vibrate rattle lol. Though I admit I got used to it. I feel like they cut my vibrate intensity in half on the 1308 update. Can any speculate if data issues could cause issues with your avatar being displayed properly in the Games hub? I bought an outfit that won't suddenly won't display on my L920 but shows fine on the console. No idea why..